We are coming into hot spot or moist dermatitis season. 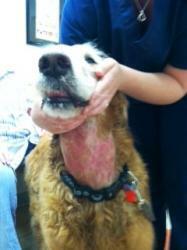 The above pictures are of Calvin, who is the second dog we have seen today with moist dermatitis. This area of inflammation is typical in swimming dogs. The hair under the ears, chin, and under the collar tend to stay wet after swimming. With the heat and humidity, it is the perfect place to have hot spots occur. The dogs will be itchy around the neck and have an odor to this area. 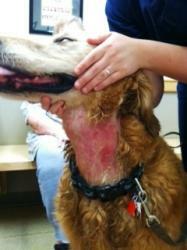 Please seek veterinary attention if you see this with your dog and be sure to have dry them thoroughly after swimming.